I’ll be honest. We left tired. We left burned-out. We left hurt. We left frustrated. We left with relief. We left Mozambique the summer of 2011 with no intention of returning. Yet here we are, going back. How did this happen? Well, if you’re interested to know, read on. There was a large church in Beira named after the place in Genesis 32 that means “Face of God”, and that was the church’s mission, to bring people face-to-face with their Maker. When we arrived in 2009 there were about 200-300 in attendance on an average Sunday, but God was moving powerfully through their church, lives were being transformed, and it was exciting. By the time we left, they had outgrown their building and were meeting in a basketball stadium with over 2000 at every service. Even though it wasn’t the church we regularly attended (we had a church on our base in Dondo), it was a bright spot every time I could get there. One of the biggest things I loved about the church church was testimony time. Nearly every church service, they would invite people up to share how God had worked in their lives that week, and some of the stories were astounding. People came with their witchcraft junk to be publicly burned. People came with stories of miraculous healings and deliverances from demons. People came with stories of reconciliation and the restoration of relationships that had been broken for years. People expected God to change their lives, and He was obliging. God was moving. It was powerful. It was exciting. So there’s the backdrop for our story. Strictly speaking, part of our ministry while we were over there but we attended and helped out whenever and however we could. Jon built them a website and I helped a bit with the graphic design and translation work for that. We attended some of their special events and conferences to help pray for people. Just little stuff. 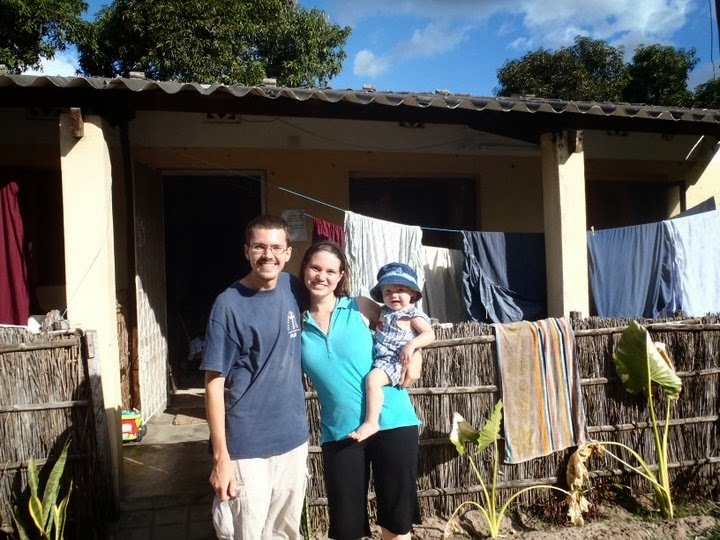 But we loved working with the pastor and his leadership team, all solid followers of Jesus, all in love with God, and all passionate about seeing their fellow Mozambicans know, love, and follow Jesus too. Before we left, the pastor asked if we would consider staying and helping him with a project he was undertaking, of starting a new college in Beira. It would offer a practical, academic education in various skills but have a biblical, Christian foundation. There are lots of Bible schools all over Mozambique, but only about a dozen colleges or universities, half of which are in the capital city in the far south. As a result, there are very few people with higher education, and this has had a profoundly negative effect on the economy. Most businesses and exports are controlled by foreigners, so even though Mozambique is rich in many natural resources, most of the money gained from those resources ends up syphoned out of the country rather than being used to build it up. They need more of their own people who can operate businesses more effectively, teach schools more effectively, run farms more effectively, and make use of their natural resources and tourist attractions (beautiful beaches and wildlife reserves) more effectively, to benefit their country up rather than just watch all their resources disappear to foreigners. At first we thought this college plan was a great dream of a visionary, but probably not practical, but after we had been back in the States for a while pastor contacted us again and said that he had the government paperwork done to establish the school (VERY big feat with all the bureaucracy! ), and that he was even given some land on which to build it. Would we consider coming to help him with the administration and academics? For those who don’t know us well, ever since we got back to the States Jon has been working in college administration and I’ve been teaching English for about 10 years now, mostly at college level. To the pastor, we sounded like a good fit for what he wanted to accomplish. We weren’t so sure at first, after all the hardships we had endured our first time in Mozambique we didn’t particularly relish the idea of returning. One of our difficulties was with visas, as we spent two years trying to attain residency status (their equivalent of a green card), but because of one thing after another we were limited to tourist visas… which meant we needed to leave the country every one to three months. It was a pain. Nevertheless, the seed of helping start a college was planted in our minds, and over time God watered and tended that seed until we were actually starting to think about it, then seriously considering it, and then committing to it. Now in full bloom, we’re taking steps to start a non-profit organization to provide the structure and support we’ll need to go back in August or September of this year and help bring this dream to fruition. However, the scope of our organization extends beyond just helping with the college. Most groups in our area focus on numbers—how many children were fed, how many Bibles were distributed, how many churches were planted—our organization will focus on depth rather than breadth. We would rather see a dozen believers transformed by knowing God deeply and making an impact among their own people, than see hundreds raise their hands at a crusade without even really knowing what that means. Our goal will be to equip Mozambicans both educationally and spiritually through friendship and discipleship. We also hope to set up a network to connect Mozambicans to mature believers in other countries who can mentor them and help them grow spiritually (since we’re only two people!). We believe this partnership has the potential to be mutually beneficial, as where the Western church tends to be weak, the Mozambicans are often strong, such as in knowledge of spiritual warfare and living day-to-day by faith. Poverty is a major problem in Mozambique, but we feel that the way it has been traditionally has not always been the most helpful. We want to remove the “white people are gods and will take care of the poor for us” mentality, and instead train up the Mozambicans to help their fellow countrymen. We want to help the Mozambicans carry to fruition their own vision for their nation rather than see them work on our goals for their country. Through discipleship and education we hope to instill both the God-given mandate to help the “least of these”, and the skills and resources to do so. Our theme verses are John 15:5, 16: “Yes, I am the vine; you are the branches. Those who remain in me, and I in them, will produce much fruit. For apart from me you can do nothing… You didn’t choose me. I chose you. I appointed you to go and produce lasting fruit, so that the Father will give you whatever you ask for, using my name.” Our goal is that lasting fruit. We may not see instant fruit, or much fruit, but we want to see lasting fruit. Ten, twenty years down the road, we hope that Mozambique will be better off because we were there, God will be glorified, and that the Kingdom will grow both in depth and numbers. 1 Reply to "Back to Mozambique"
Awesome, sounds exciting. Welcome back to the 'neighbourhood'!